Located in St. Louis County real estate, homes for sale in Richmond Heights MO are located in an inner ring suburb. The Galleria Mall is just outside the city limits and provides a great shopping experience. Richmond Heights MO Real Estate and Richmond Heights MO properties are a perfect addition to the St. Louis Real Estate market. Richmond Heights real estate is made up primarily of established/older homes, the average aged home is 72 years. Homes for sale in Richmond Heights MO range in price from about $80,000 to about $1,000,000. The median home price in 2014 was approximately $425,000. Residents of Richmond Heights can enjoy all of the public parks and facilities in the area and in an effort to support all of the communities, Brentwood and Maplewood facilities are all jointly shared. The Maplewood Richmond Heights school district is one of the oldest in the County and covers a 2 mile radius. Please see Great Schools for up to date ranking on every school in the area. If you are looking for a home for sale in Richmond Heights MO or you would be interested in buying a home in Richmond Heights, please contact St Louis County real estate expert, Sharon Colona and St. Louis Realty for a professional and simple buying or selling process. Call (636) 397-7653 or email at scolona@stlouisrealty.net. Showings begin by appointment 4/13. This Georgian Colonial in Hampton Park has old world charm & updated for today x2019;s living w a gated entrance. Grand entry foyer w open wide staircase, 10 ft. ceilings on the main level, moldings throughout. French drs lead you to formal dining rm, living rm, den w a hidden bar. Amazing kitchen! Gourmet in style w a large center island, high-end SS appliances & a separate breakfast rm. Family rm, office & full bath on the 1st fl. are private & could be ideal for a main level guest suite. The luxury master bedrm will not disappoint you! His & her sinks, a steam shower, jetted soaking tub, private water closet & a walk in closet (20x12). The 2nd level has 2 bedrms attached by a jack & jill bath, additional en suite, & the laundry rm. A playrm/bedrm, a sewing rm, 6th bedrm & a full bath finished the 2.5 story. Several gathering areas-the pool & patio, deck, brick & stone patios & 1.2 acres of flat yard, 3 car attached garage. This home is a true delight! Impressive English Tudor located in coveted Lake Forest. Gracious foyer w/wrap around staircase. Stunning step down living room w/archway anteroom leading to lovely shaded brick patio. Huge dining room, great for entertaining, w/large bay window, overlooking expansive deck. Enormous eat-in kitchen. First floor bedroom/den w/adjoining bath, plus a pretty formal powder room off the entry. Access the 2nd floor by the grand front staircase or back stairs. Expansive master suite has large dressing room w/built-in closets and new master bath w/large shower w/double shower heads and seated bench. Three more large bedrooms and one bath complete the 2nd floor. Walk up 3rd floor awaits your finishes or relax in the finished lower level w/3 large rooms for kid and adult play plus a half bathroom. Stained/leaded glass windows, Terrazzo floors on main, hardwood on 2nd. Newly landscaped. Fabulous floor plan. Great home for entertaining and family living. 2-car rear entry garage. Clayton Schools! OPEN SUN 4/21 1-3pm. Stunning Georgian Colonial on .49 acres in the prestigious Lake Forest Subdivision! 6Bd/5.5Bth & 5800+sqft of living spc w/LL.1st Flr boasts light & airy Living Rm, w/French doors & FP, formal Dining Rm w/stained wainscoting & crown molding; a wonderful Study/Den w/arched bookcases. Spectacular Great Rm w/tall ceilings, large bay, gorgeous custom FP & awesome wet bar! Gourmet Kitchen w/custom cabinets, granite counters & backsplash; breakfast bar, bay window w/seat & SS appliances. Spiral stairs to 2nd Flr w/Master Ste w/Sitting Rm, luxury Bth w/jetted tub, separate shower & huge walk-in closet could also be Fitness Rm too! Also find 4 add x2019;l Bedrms & 3 full Bths! 3rd Flr boasts legal 6th Bd, Media Rm or Play Rm. Highlights:gleaming wood flrs, newer HVAC, 2 newer water heaters, updated plumbing/electric & oversized rear-entry garage. Partially finished LL w/Rec Rm, full Bth & plenty of storage! Relax outside on large patio & admire park-like yard. Clayton Schools! This is an enticing opportunity to own a classic Lake Forest home in the award winning Clayton school district. Enter to find beautiful architectural detail, grand sized rooms, terrazzo foyer & stairs with hardwood floors throughout most of the rest of the house. This property, set in a prime location in the neighborhood has everything today's buyers want and need - formal rooms, family room, sun room, kitchen, breakfast room & large walk-in pantry area on the 1st floor. Upstairs is the master retreat with bedroom, and sitting room/office. Additionally, there are three or four large bedrooms and 3 full baths. Bedroom #5 with bath is privately located off the back stair. The lower level has endless possibilities for a rec room with FP, including loads of storage space. Outdoors is a heated Baker pool, deck, gardens & over-sized garage. The most recent improvements include slate roof, furnaces (2 units) 2016 & 2018, newer pool heater and filter. $20k credit for 2nd flr bath renovation. New Price to allow you to update to your heart's delight and add that dream kitchen! Built in 1927 by George F. Bergfeld & designed by Nolte & Nauman, this Hampton Park Tudor Revival has five bedrooms, 4.5 baths, plus a beautiful study, & magnificent architectural details throughout. Enjoy the sun room or the screened porch overlooking the peaceful and spacious yard. The home also features plenty of storage with two attic areas (one with a large walk in cedar closet), a main floor laundry, & a lower level recreation room that looks like it could be in a castle. There is also plenty of additional storage & work space in the basement. Ample parking is found in the tuck under garage, a detached garage, & in parking spaces along the driveway. This is a very unique, must see home awaiting a buyer who appreciates quality, historic architecture, artistic detail, and an opportunity to design their own dream kitchen. Opportunities like this do not come along very often! Spectacular 2Sty on a .32 acre lot in the prestigious Lake Forest! Boasting a fabulous open floorplan w/4 Bds, 3.5 Bths & 3300+ sqft of living space w/LL. Entry Foyer is illuminated by recessed lights & features gorgeous curved staircase. Arched opening leads to Living Rm w/custom bow window, crown molding & cozy gas fireplace. Office is enclosed by lovely floor to ceiling windows, creating a serene feeling! Updated Kitchen w/wall of built-ins, center island, SS appliances & adjoining Breakfast Rm! Master Ste w/huge walk-in closet, dressing area & luxury Master Bth. 3 add x2019;l nice sized Bds, 2 are joined by a Jack-n-Jill Bath & 2 w/built-ins. Finished LL is awesome; ideal for entertaining w/large Family Rm w/wood burning fireplace, stylish wet bar & full Bath! 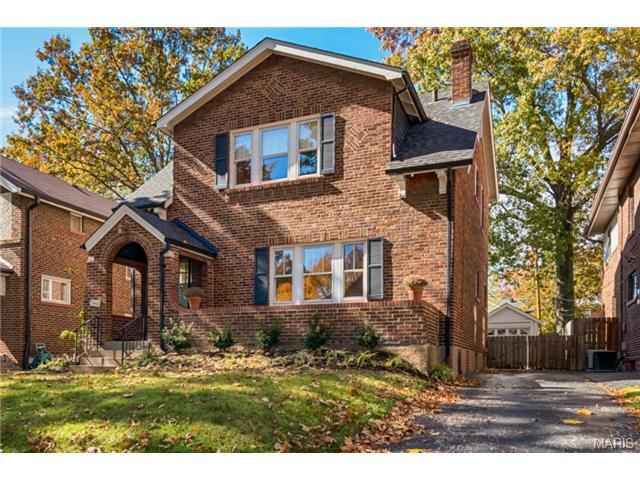 Great location x2013; walk to Downtown Clayton restaurants, shops & galleries; short drive to Wash U, Barnes, Forest Park & Delmar Loop. Easy access to hwys! Top-Rated Clayton Schools! Beautiful 1.5 story situated on a cul-de-sac with 7 car garage, patio, and screened porch. As you enter the charming spacious foyer you will find a private study with gas fireplace and built-in bookcases & cabinets. The large dining room with bay window, coffered ceiling, and butlers pantry, perfect for family gatherings. The 2 story great room with fireplace opens to a walk up wet bar and opens to the patio & porch. The kitchen is the heart of the home with custom cabinets, granite countertops and breakfast bar which adjoins the breakfast room and main floor laundry. Main floor master wing with his & her walk-in closets, bay window and full bath with his & her vanities, walk-in shower and jacuzzi tub. 2 additional upper-level bedrooms, 2 full bathrooms, and loft area with nice kitchen area and fireplace! Rec room, sauna, and full bath on the lower-level. This gem is sure to impress! Sophisticated 2 bed/ 2 bath condo with over 2100 square feet. Gleaming hardwood, 9 x2019; tall windows, soaring 11 x2019; ceilings are just a few highlights. Private patio w/green space is a true luxury. The open concept space features see through fireplace,, custom millwork and a coffered ceiling with uplighting. The kitchen is outfitted with stainless steel appliances including a gas range. A spacious master suite includes a walk in closet with custom built ins and bath with double vanity and a separate tub and shower. The second bedroom is located right across the hall bath with designer finishes including marble tile. Tons of storage and a large utility room are functional delights. Don x2019;t miss the dedicated 2 spaces in the heated garage. Experience a Manhattan penthouse lifestyle located in Clayton schools and in an area recently named the best place to live in the state. Walk to coffee, restaurants, a move and Forest Park and just minutes to BJC, Washington University, Cortex, and more. EXCELLENT VALUE IN THE CLAYTON SCHOOL DISTRICT. Custom built move-in ready 2600 sq ft 12 yr old home with a great floor plan for entertaining and comfortable living. An expansive covered front porch opens to this light-filled home with lots of windows (including 2 bay windows). The main floor includes a center island eat-in kitchen opening to a den w/gas fireplace, a cheerful sun rm, a MBR w/private ensuite bath & walk-in closet, main floor laundry & guest half bath. The 2nd floor has 3 additional large bedrooms (add a door & closet to the big office to make it an official bedroom),a large hall bathroom & lots of closets. Spacious walk-out lower level with high ceiling & bathroom rough-in is just waiting to be easily converted into additional living space. 2 car off street parking (proposal available to build a garage) is just a few steps from your back door! Low maintenance yard give you more time for weekend fun! Area home values include nearby $650,000+ new home construction. Easy Living in Newly Renovated 7 Room Home! Quality workmanship throughout 1,400 sf finished Living Area ($207/sf). Main floor Foyer, Living Room, Dining Area, Kitchen w/ Pantry, 3 Bedrms, Full Bath. Finished Lower Level has TWO 11 x2019;x9 x2019; Bonus Rooms, Half Bath, 15 x2019;x12 x2019; Hall/ Sitting Area, Laundry Room, large Storage Room. ALL NEW IN 2018-2019: granite counters; SS refrigerator/ range/ range hood/ dishwasher/ sink; tile floors; wood floors refinished; carpet on stairs; baseboards; painting; light fixtures; ceiling fan; R-38 insulation; roof; Hardie siding; concrete driveway/ retaining wall/ front steps/ sidewalk/ porch; gutters & downspouts; fascia; window wraps; window screens; front yard sod; 10x8 metal Storage Shed. The home has thermal windows, concrete patio in large fenced backyard. 1-year AHS home warranty. Terrific Location-- Clayton Schools. Walk to MetroLink stop & Galleria. Near Hwys 170, 64/40, downtown Clayton, Shaw Park, Wash U.